See those two shoes up there? The ones that don't match, not even close? 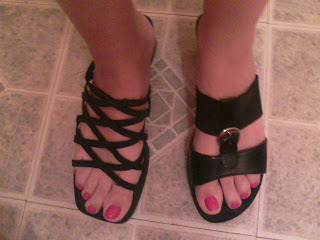 Yours truly managed to leave the house last night in those completely different shoes. Apparently, when I checked myself out in the mirror before I left, I failed to look at my feet, which is not too surprising considering I pretty much never do that. What is odd is that I must have put each shoe on without looking at what I was doing. For the love of Pete, I know those shoes are slip-ons/backless, but how could I not catch a glimpse of them while sliding my tootsies in?! And as you can see from the photo, the structure is quite different. Any marginally coherent or observant person should notice that they don't feel the same. As I was trying to fall asleep last night, our family vacation to NYC, back when I was around 9, came to mind. I am certain this memory came from something else, and perhaps by the time I finish this post, it will come to me. Only a handful of things from that trip have remained in my memory. We took a train to get there, and I remember sitting next to a nice, bearded guy who played games or talked to me for most of the ride. As I was thinking about that last night, I was pretty sure there is no way I would let my kid, who will be 8 in just over a week, sit next to a man we did not know. But times have changed, and I am over-protective (but, I swear, getting better). Over the past few years, I have gotten a lot more environmentally friendly. But I am afraid the more I try to do to help better the environment, the more I end up hurting it, or wasting, at least in some other way. Example 1: I use reusable bags every time I shop. (I make an exception for my Kohl's visits, as I use those bags to line my bedroom garbage can.) The problem is, the bags get dirty and germy, so I sometimes spray them with a disinfectant spray. But isn't that just harming the environment too? Example 2: Years ago, before I lived in a place that recycled, I threw things in the garbage as soon as I finished them. End of story (for me, anyway). But now I rinse jars, jugs, and cans because I don't think you are "supposed" to leave food particles, remnants of PB, etc., on them. And that, of course, means using water unnecessarily. Maybe I don't need to do this, though? Is self-awareness a good or a bad thing? I consider myself to be extremely self-aware. It is more than that really; unfortunately, I just don't know the correct, most applicable adjective to describe how obvious all my short-comings are to me. I am long-winded. Obviously, I ramble on and on (and on and on) in most posts on this blog. I have little doubt that most of you who read my blog skim it, rather than reading every single word. It's tiring just writing the posts! And I know that I talk too much (and sometimes interrupt people as a result of my talking so much). However, when I am around people whom I don't know well, I am actually pretty good at letting others take over the conversation. At a neighbor's party two weeks ago, I spent about one and a half hours talking to a woman I had just met. Actually, I talked about 15 minutes; my "new friend" pretty much monopolized the rest of the conversation, which was fine by me.